Now with the NEW Class Student Engagement Feature! Unprecedented visual engagement combined with interactive content development and student collaboration! Maximum Engagement: Device Integration. Student Fascination. The new Sphere2 software adds enhanced visual capabilities to lesson creation, 1 to 1 student engagement and collaboration. With the ability to add multiple cameras and content in one screen and with the new Class Student Engagement feature, teachers can transmit screenshots directly to your students' devices over existing Wi-Fi networks. 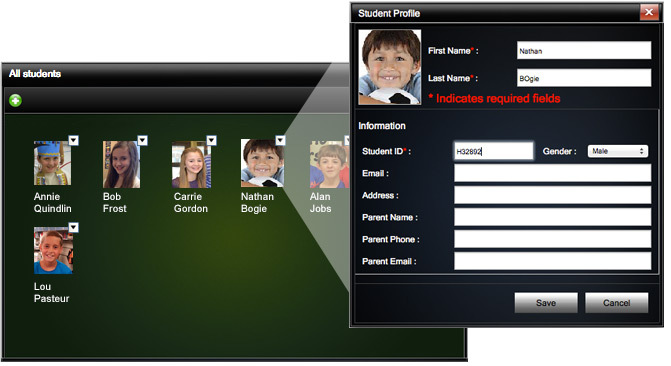 Students can easily view, and interact with curriculum on many levels, whether at school or at home. Sphere2 now allows you to configure your software to recognize students' devices that are equipped with the ClassSend app. Teachers can not only create, record and share their custom lessons, but they can now interactively send their content to their students' devices, ensuring their direct participation in the classroom session! 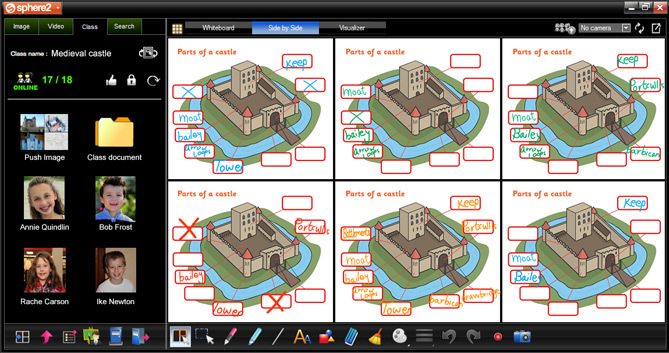 Through the ClassSend app, students are empowered to modify, annotate and transmit their work back to the teacher! Sphere2 is a complete presentation, content development and sharing software solution; however its simplicity is just as extraordinary as what it does. With easy to navigate tools to present live video, control your document camera(s), annotate, manipulate, record and share. Your students will be actively immersed in your curriculum. Sphere2 annotation tools: comprehensive, yet intuitive! One Camera? Two Cameras? Three? 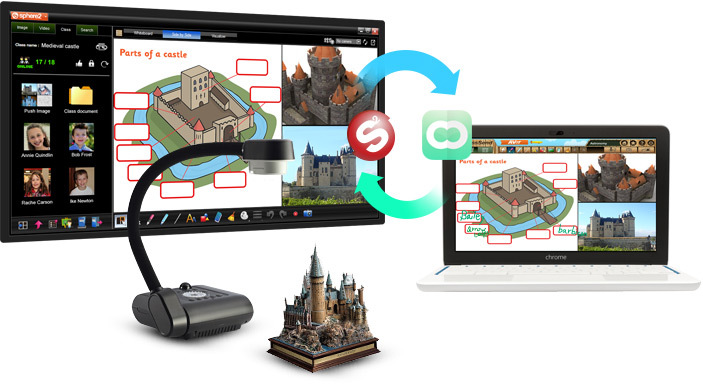 Sphere2 allows you to present content from multiple sources, organized in up to 6 screens at one time. It also allows you to display live video from your document camera, wireless camera, and even your web cam simultaneously! A chemical reaction can be demonstrated under the document camera, as the teacher is presented live through the webcam. A wireless camera can be at a student station as the group conducts the experiment at the same time, all being viewed by the class. Additional content such as the Periodic Table or results can be displayed in other screens, as well. Then using the new Class feature, send a freeze-frame of the experiment to each of your students' 1 to 1 devices, asking them to annotate (using their device's ClassSend app) where the key elements can be found on the Periodic Table. To learn more about the ClassSend Student Engagement app, click here. Whether presenting content in one full screen, or as many as 6, you can rearrange the windows, resize them, mark and annotate over all, then record the entire lesson from start to finish. All screens, including all annotation and audio can be recorded as one complete video. One of the unique features that Sphere2 offers is the Spotlight feature. The Spotlight feature focuses attention on a key area in your slide. When used, the feature turns the entire slide area completely opaque while exposing a region of the screen. You can control the size, shape and position of the exposed area, which is perfect sectioning off problems on a worksheet. The Visor feature allows you to cover any area of the screen with an opaque rectangular shield. The shield can be moved either vertically or horizontally to reveal and hide areas as necessary. You can even adjust the transparency – perfect for reviewing exam questions and answers. Whether you are moving an object under an AVer doc cam, narrating over a website, annotating over your lesson or playing a video, Sphere2 captures all your actions with crystal-clear video and audio. With your complete lesson recorded, you can instantly upload and share it to DropBox, YouTube, Facebook, or even your classroom management site. 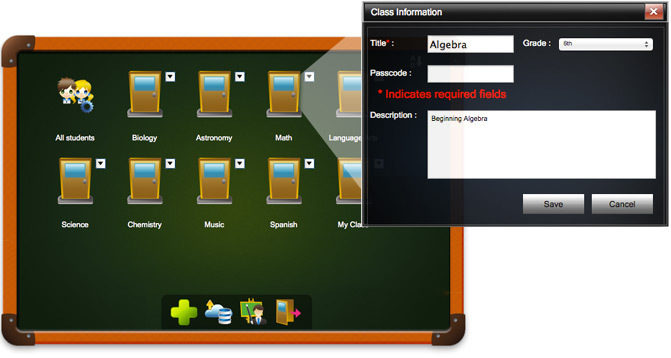 Lessons can be pre-recorded for substitute teachers, and flipped for students to view at home. 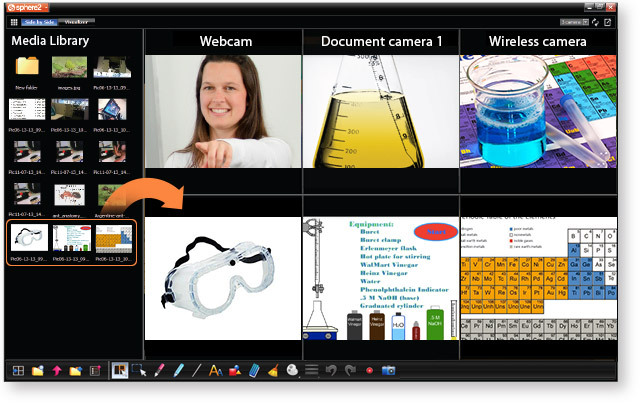 Student presentations and projects can also be recorded and shared anytime, anywhere. Sphere2, with the new Class Student Engagement feature, provides the tools for you to have immersive and stimulating direct engagements with your students. Now, using your 1 to 1 classroom technology, you can send lesson content directly to your students mobile devices - and receive their updated content! Integrated seamlessly into Sphere2 Software , the Class tab provides the tools to create your virtual classes or subjects, as well as populate them with your student profiles. Catapult your students directly into the heart of your subject matter. 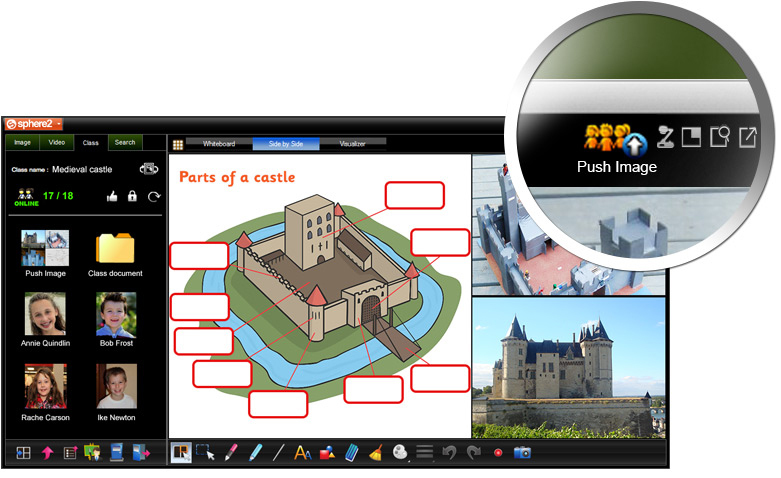 Receive and share through their ClassSend app's annotation features, students can identify the castle keep, gatehouse and moat -- and send their responses back to you! Teachers can display each students' contribution to the lesson! Sphere Lite is now available for Chrome browers! Download the app on the Chrome web store and stream live video from your document camera. Below are a few ways to enhance your curriculum with Sphere2. Also, be sure to check out our resources page which is filled with tips and tricks on how to use your doc cam, TabCam and other tools to engage and inspire your students. 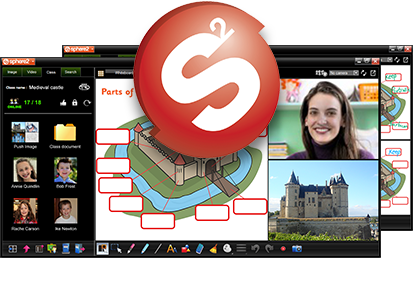 Sphere2 gives you the ability to present, interact, display and record all elements of your lessons. Whether live, saved or recorded content, all pieces of your lesson melt into a fluid, comprehensive and engaging lesson. Instant upload makes your lessons available anytime, anywhere, and for anyone you choose to share it with. How does Sphere2 enhance a lesson? Let's imagine a science lesson being conducted. It's all about being dynamic. Simultaneously show what's in the Petri dish, a live image of you, along with .jpg images or videos of the control or initial stages of the experiment. So no matter where you are in the classroom (even if you are over the sink), students get a front row seat to what's going on. No more "I wasn't there" excuses. You can record your entire science lesson with annotations and highlights, as well as upload to YouTube, DropBox and more effortlessly. Then, with one easy forward of a link, everyone is up to speed – in and out of class. With Sphere2, watching the recorded lesson is just like the live experience. Currently the biggest buzz in education is "flipping your classroom." What is the flipped classroom? According to an article in the New York Times, "It's an "inverted" teaching structure in which instructional content is delivered outside class, and engagement with the content – skill development and practice, projects and the like – is done in class, under teacher guidance and in collaboration with peers." Basically With the ability to record and share dynamic eLearning content, Sphere2 makes it effortless and engaging for you to flip your classroom.